A ripple effect of consequences stemming from a lie is a story that could happen at any time, and in many different instances. The reasons for spreading a falsehood and its repercussions are the complications explored in the plot of “The Children’s Hour” by Lillian Hellman, which William & Mary theatre will stage Oct. 4-7 at the Kimball Theatre. Because it contains mature subject matter, it’s recommended for audiences ages 13 and older. 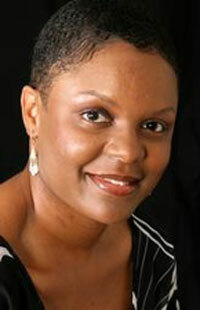 “With attention to both the 1934 and 1952 versions of the play, as well as the true account upon which Hellman’s work was based, I wish to build an inclusive ensemble with intentional regard for challenging perceptions around ability, color, gender expression, physical type and sexual orientation,” said Director Artisia Green, associate professor of theatre and Sharpe Associate Professor of Civic Renewal & Entrepreneurship. “Further, I seek to explore how the consideration of these signifiers in casting work together to create a nuanced, three-dimensional production and inform public understanding of this classic text." 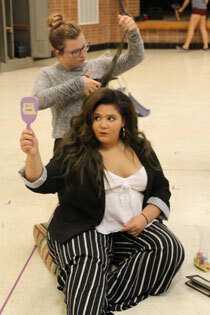 Women’s iss ues are emphasized in the production, focusing on relationships between women and themes of lesbianism set in an era when such an accusation was very serious. But it’s the diversity of casting for the show, still set in 1934 in a rural New England farmhouse, that Green will use to bring it up to date. “I was much more interested in creating the kind of environment that you might be more likely to encounter in a classroom here at William & Mary,” she said. “And so I’m also aware of the fact that each of us as an actor, we carry certain histories and socializations in our bodies. And I don’t want actors to lose sight of who they are and what they carry with them as they learn to pick up the truths and the history of the characters in Lillian Hellman’s work. The mostly female cast includes students who self-identify as queer; some lead roles are played by African-American women, and the main student character is played by a multiracial actress, which Green said was the case with the character in some scholarship she encountered. That character, Mary Tilford, is ostracized by other students. She eventually runs away, telling her grandmother that the two headmistresses are having an affair so that she won’t be sent back to school. Eschewing previous readings that demonize Mary, Green said she’s more interested in exploring the trauma that Mary carries that would lead her to such behavior. Student cast members are excited to put a modern spin on a play first staged in a distant time period and based on a true story from 1810 Scotland. 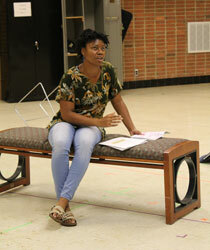 “I wanted to be in this play because it deals with ideas from the 1930s that are still very much controversial today,” said Divinity Summers ’20, who plays headmistress Karen Wright. “I wanted to see how the play would be changed to fit modern views, but still keep to the script. Anna Boustany ’21 portrays vengeful student Mary Tilford. Everyone should be able to relate to some part of this very universal story, according to Green. “We all have struggled with feelings of isolation and social constraint at one time or another,” Green said. “The true tragedy of ‘The Children’s Hour’ is the community’s failure to honor Martha’s authenticity. Mary’s ‘lie with an ounce of truth’ is the inception of a series of troublesome events. However, it is the community’s condemnation of Martha, which leads to the tragic ending.